Courtyard Santa Clarita Valencia is the perfect place to stay when visiting Southern California. Our hotel near Six Flags Magic Mountain, Hurricane Harbor, TPC Valencia and Princess Cruises headquarters boasts a convenient location for business or leisure travelers. Retreat to spacious guest rooms and suites with thoughtful amenities including complimentary Wi-Fi, marble bathrooms and Nintendo video games for the whole family. The Bistro - Eat. Drink. Connect. offers healthy and hearty breakfast and dinner options plus Starbucks coffee and evening cocktails. The Market at our Valencia hotel is open 24/7 for late-night snacks, toiletries and various sundries. During downtime, work up a sweat in the state-of-the-art fitness center with free weights and cardio machines or catch some rays while lounging around the outdoor pool and hot tub. With two event rooms totaling 1,000 square feet, our hotel is ideal for small meetings or intimate social soirees. 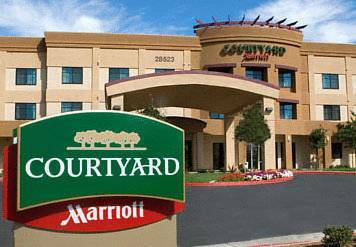 Book a night at Courtyard Santa Clarita Valencia now. Enjoy our fully-stocked bar and daily events. Call if you would like an events calendar mailed to you. Open Mon-Fri, 5pm to 9pm. - Fillmore & Western Railway Co.